Sit up and pay attention, Shield owners: Nvidia’s GeForce Now, a Netflix-style game-streaming service, is bringing some big games from another top studio to its catalog. Nvidia announced Thursday that Square Enix would bring five games to GeForce Now over the course of 2016. 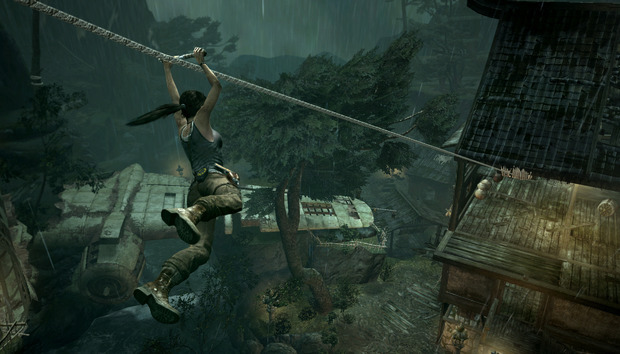 The first game will be Tomb Raider, the critically acclaimed 2013 series reboot, which hits the service today for every GeForce Now user to freely stream as part of their subscriptions. Following that, Nvidia and Square Enix will also roll out Sleeping Dogs, Lara Croft and the Guardian of the Light, Quantum Conundrum, and Murdered: Soul Suspect. Nvidia didn’t give any specifics as to when each game would hit GeForce Now, but the company says to watch for “Shield Tuesday” announcements in the coming months. Nvidia says it expects to make more announcements this year that are similar to today’s Square Enix partnership. Why this matters: The addition of the five Square Enix games brings the GeForce Now library to around 84 games. That’s not a lofty number, but the catalog's steadily growing, and it’s healthy enough at this point to satisfy many gamers—especially ones without deep PC game backlogs. That total includes the "free" games subscribers get to stream with their membership, as well as the paid games Shield owners have to shell out for separately before streaming them. The majority of the games, around 58, are free to play. Newer games such as Mad Max and Witcher 3 or titles from big name series such as Saints Row, however, require you to pay extra. If you’re interested in trying out GeForce Now you’ll have to make an extra hardware purchase. The service requires either an Nvidia Shield Android TV set-top box, the Shield K1 tablet, or the Shield Portable—even GeForce graphics card owners can't tap into GeForce Now. For the full scoop, check out PCWorld's review of Nvidia's game-streaming service.